For a while now my cookbooks have been collecting dust. Yesterday however, I was able to unwind a little and sit down with one of my favourite cookbooks in my collection, “Red Hot – A Cook’s Encyclopedia of Fire and Spice”, to try something new. My hubby and I both love spicy food and I never hesitate to turn up the heat in any dish. This book features a wide array of recipes using different chillies, both dried and fresh. I was planning to make Enchiladas with the Guajillo sauce that night, and wanted something to go along with it. 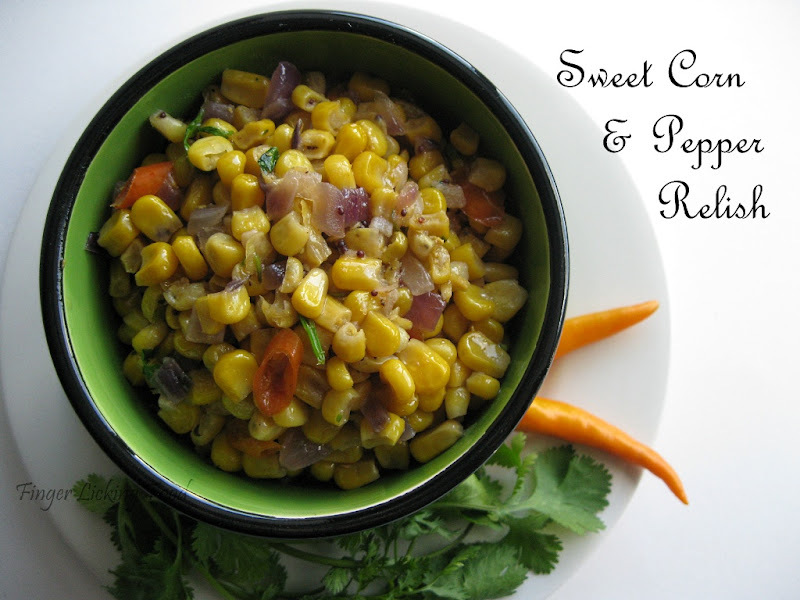 This sweet corn and pepper relish was just the right thing. Heat oil in a pan. Add the mustard and when it begins to splutter add the chopped garlic, onions and red chillies. Saute till onions are soft and cooked through. Now stir in the coriander powder. Cook for a minute and then turn off heat. Stir in the sweet corn and season with salt. Drizzle the lime juice, combine and garnish with fresh chopped cilantro. This can be eaten warm or at room temperature. 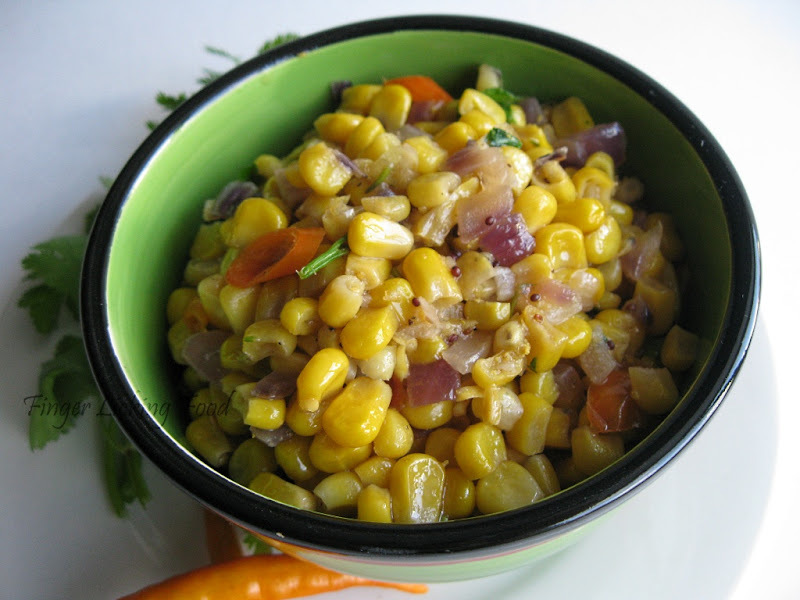 Opt for canned corn rather than frozen, if possible, as the canned kernels are ready to use. Saves cooking time. I did cut back on the chillies just a little bit since the Guajillo sauce is smoky and spicy in itself. The sweet corn was a perfect blend to the heat from the enchiladas. You can store leftover relish in an air tight container in the refrigerator for two days, makes for a good snack too. Great relish, would go great with so many dishes! I would love to have this as snack. I am planning to try the same recipe with chole/any Indian lentil. corn is my all time fav ! What sauce is that? You havent mentioned it in the ingredients. This looks such a great relish!! I must try this one out.